LONDON (AP) -- Juan Martin del Potro's left knee was already mummified in the yards of athletic tape it takes just to keep the lanky 6-foot-6 Argentine upright these days. LONDON (AP) — Juan Martin del Potro’s left knee was already mummified in the yards of athletic tape it takes just to keep the lanky 6-foot-6 Argentine upright these days. Then, five points into his Wimbledon quarterfinal, the man known as “The Tower” took a tumble. Chasing an overhead into the corner, del Potro’s left foot slipped out from under him on the slick grass of Centre Court. That already aching knee straightened suddenly, then bent backward. Del Potro crumpled to the ground and rolled twice into the far edge of the court. Nobody would have blamed him for quitting. First at a limp, then at a jog, then at a sprint, del Potro recovered for a 6-2, 6-4, 7-6 (5) victory over fourth-seeded David Ferrer to make his first Wimbledon semifinal. And that is how del Potro found himself preparing for a semifinal against top-seeded Novak Djokovic, whose 7-6 (5), 6-4, 6-3 victory over No. 7 Tomas Berdych ended less than five seconds after the Argentine hit his final shot. Later in the day, No. 24 Jerzy Janowicz became the first Polish man to reach a Grand Slam semifinal by beating countryman Lukasz Kubot 7-5, 6-4, 6-4. After the match, the players hugged at the net for more than 15 seconds, then exchanged shirts the way soccer players often do at their games. A bit later, Janowicz sat in his chair, clasped his hands over his nose and cried. Janowicz will play the winner of the quarterfinal between Fernando Verdasco and No. 2 Andy Murray, which went to five sets as the evening shadows started to overtake Centre Court. During a tournament with more than its share of twists and turns — to say nothing of slips and slides — Djokovic and del Potro have gone through virtually unscathed, on the scoreboard at least. Neither man has dropped a set. No. 8 del Potro wouldn’t quite use those terms to describe himself. He is, however, starting to show the form he used to win his only major championship, the U.S. Open in 2009, which also marks the last time he reached a Grand Slam semifinal. 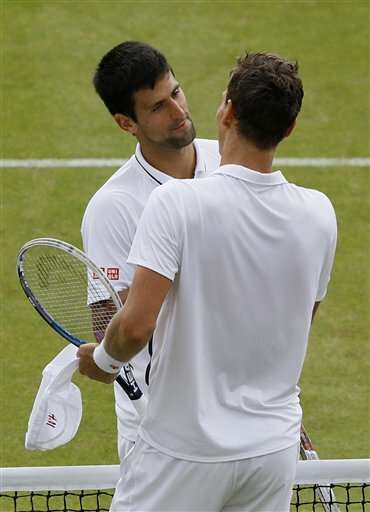 He is 3-8 lifetime against Djokovic, though one of those victories came here, at the All England Club, when he beat the Serb in the Olympic bronze-medal match last year. Del Potro also won their last meeting, earlier this year on hard court at Indian Wells. “He struggled with injuries in last few years, but every time he comes back, he comes back very strong because he just has this talent,” Djokovic said. Indeed, del Potro — full nickname “The Tower of Tandil,” after his hometown in Argentina — has won despite being wracked with pain since Saturday, when he slipped and hyperextended his left knee for the first time. He’s not the only one to slip at Wimbledon during this fortnight, and he wasn’t the only one hurting Wednesday. Ferrer has also been dealing with ankle and toe issues. He cut short his pre-match hitting session because of pain in his ankle but said that was no excuse. Ferrer, who crossed the net to run toward del Potro to check on him when he fell, said he didn’t see much change in his opponent’s play after the injury. “Juan Martin, he was more focused, he was playing more aggressive than me and he served very, very good in all three sets,” Ferrer said. Soon after his match, del Potro had an appointment with an ice tub and his trainers. His knee needs work. But there will be no day of rest for him in between matches. But tennis fans will certainly talk about it. So dramatic was the injury, it all but overshadowed a sublime display of shotmaking from start to finish against one of the sport’s grittiest players. Del Potro hit 42 winners against 11 unforced errors. His last winner — a sprinting, down-the-line forehand from off the court at the end of a 28-shot rally — sent him tumbling to the ground again, this time to celebrate a victory. Lying there, del Potro recalled thinking that was the best forehand he’s hit over his five matches at Wimbledon so far.